To enable aspiring violists to practice and perform at their best by conveying Karen Tuttle's coordination method, with the objective of facilitating the most comfortable, natural, and musical approach to viola performance. Musical practice should be a labor of love; therefore, I encourage each of my students to draw on their passion for music that inspired them to continue their musical endeavors at the college level. In order for this to be possible, students must feel free while playing, both physically and emotionally. To help my students achieve physical comfort, I draw from my own experience with playing-related injuries. Faulty technique led me to experience severe musculoskeletal problems, but I achieved rehabilitation through careful attention to proper playing technique, comfort, physically neutral postures while playing, and ease of tension throughout the body. Learning to be aware of my body and the way it reacted to playing viola was a key element of my rehabilitation, as was Karen Tuttle’s coordination method, both of which are cornerstones of my approach to teaching. My experience with Music and Medicine has increased my knowledge of the biomechanics of playing an instrument, and I draw on scientific data as well as personal experience to improve my students’ playing habits. Only when the player is physically free can the body become a vessel for music to flow. To help my students achieve emotional freedom, I strive to provide a safe learning environment in which students feel free to voice concerns or problems, even those not directly related to their playing, as any stress or anxiety can negatively affect their ability to play with ease. My degree in Psychology helps me understand my students, and to identify and gain access to the facets of their lives that motivate them to become better musicians. I often use visualization as a tool to help students convey appropriate emotional content to a piece. I also encourage singing and assigning words to musical phrases, as the natural breathing and cadence of singing and speech can be a remarkable tool for understanding musical phrasing, and can aid in emotional freedom. A goal for myself as well as my students is to continually expand and refine technical abilities and musicianship. Because of this, I focus on the importance of both the muscles and the mind. Playing viola is more than mere muscle memory-- the mind must be engaged in self-observation and self-analysis for musical development to be possible. I believe that all students have the ability to excel, if only they possess the desire to do so. As such, tapping into the motivation to improve is a top priority. In addition, I strive to discover each student’s learning style, which allows me to continually cultivate my pedagogical method. My ultimate goal is to guide each student to find his or her own unique musical voice. 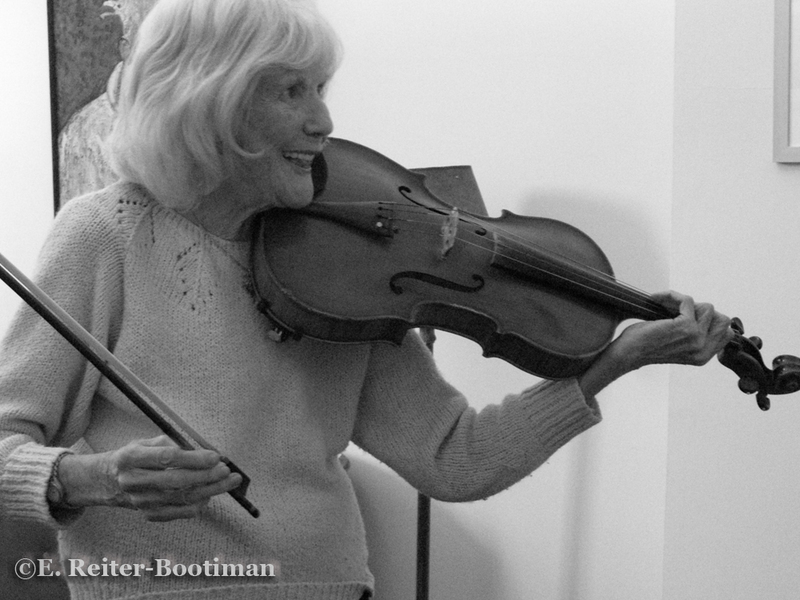 Coordination is a technique of viola playing originally taught by American-born violist, Karen Tuttle (1920-2010, pictured below), and now taught by viola performers and pedagogues across the world, including Kim Kashkashian, Jeffrey Irvine, Karen Ritscher, Carol Rodland, Michelle LaCourse, Susan Dubois, and Katrin Meidell. Loosely described, coordination is a physical and emotional approach to playing viola that emphasizes comfort and ease of playing. There are many aspects to coordination-- including stance, physical releases, musical impulses, and correct instrument set up so that it balances on the body rather than is held-- that contribute to free and resonant viola playing. Dr. Meidell studied coordination in depth with Michelle LaCourse, Carol Rodland, and Susan Dubois, all of whom studied with and were teaching assistants to Karen Tuttle. Photo by Emmanuella Reiter-Bootiman. Used by permission. Did you know that unlike an injured muscle that can heal itself, once hearing is damaged, it cannot be repaired? As musicians who have a fairly loud instrument directly under our left ears, hearing health is something that should not be taken lightly! Loudness is a subjective phenomenon, and even though what you're hearing might not seem too loud, it could still do damage. So how do you know? Sound intensity is measured in decibels (dB), and a sound level meter (SLM) can give you an accurate gauge of how intense volume is. If you have an iPhone, you can download this free SLM. If you have an Android, you can download this free SLM. While apps aren't as accurate as a true SLM, they will give you a fairly accurate reading of the level of sound intensity to which you are exposing yourself. But how loud is too loud? The chart below (which can also be seen here) shows the accepted standards for sound exposure. At 85 dB, you can safely listen for 8 hours without risk of hearing damage. For every 3 dB increase, the amount of safe exposure time decreases by half. So for 88 dB, you can safely listen for 4 hours, and for 91 dB, you can safely listen for 2 hours. Orchestras can easily reach over 100 dB of sound intensity (! ), but rehearsals are never a mere 15 minutes long, which would be the safe amount of exposure time to such levels. Since you cannot turn down the volume of your orchestra, nor can you move away from the rest of the viola section, your only option is to wear hearing protection. I wear ear plugs very often when rehearsing and performing. It takes a little while to get used to hearing yourself and the ensemble through the plugs, but I acclimated quickly, and now do not hesitate to use ear plugs if I think the volume is too loud. Remember: Once hearing is damaged, it'll never come back... So wear ear plugs!